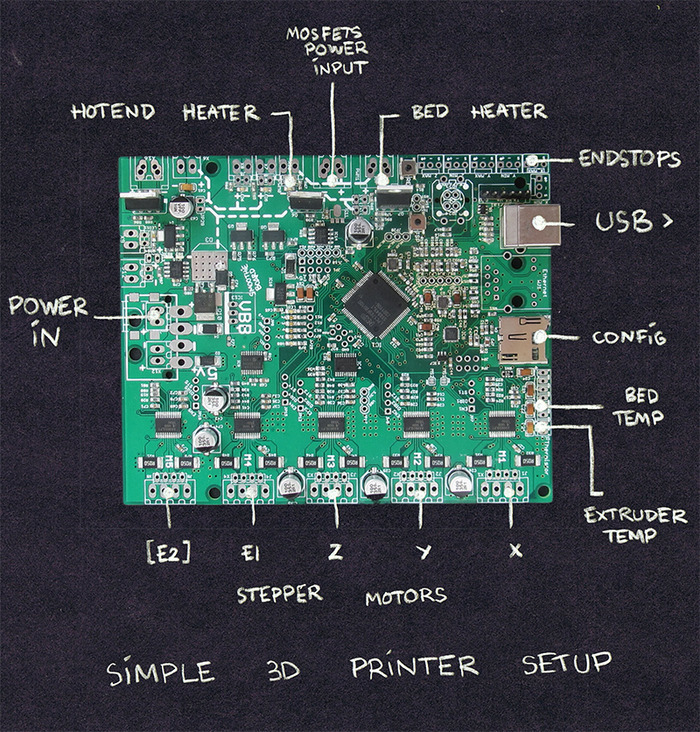 In the latest issue (number 2) of the RepRap Magazine (http://reprapmagazine.com/) there is an excellent review on the topic of electronic boards for RepRap 3d Printers. This article was made by RichRap (http://richrap.blogspot.pt/), one of the great promoters and enthusiasts of the RepRap cause. 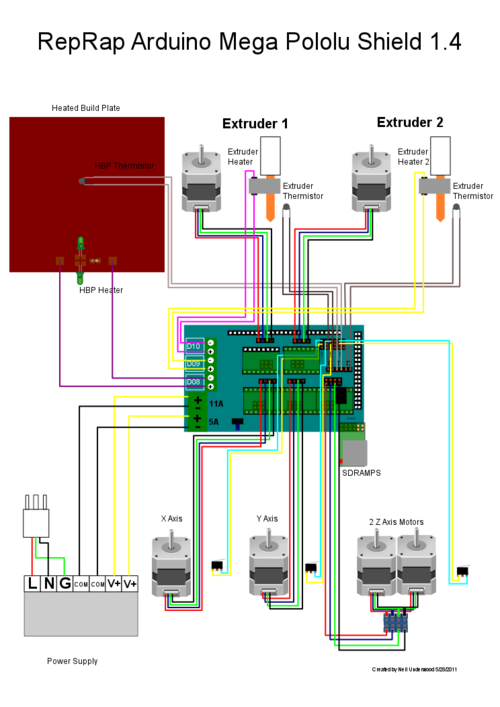 The article covers with certain degree of detail the experience of RichRap with five of the most popular electronic controllers of RepRap printers: the RAMPS, the Megatronics, the Minitronics, RUMBA and Elefu-RA. He also points out five more boards that compose the avant-garde of RepRap electronics: the Easy Electronics, the RAMBO, Astreeg X3, 4Pi and the Smoothieboard. But most interestingly, the article has a nice table from where the experienced RepRaper can compare them at a glance and the newbie, as in our previous post (http://poti-poti.org/2013/10/16/understanding-3d-printers-comparisons/), can get to know what features are important in a controller board. 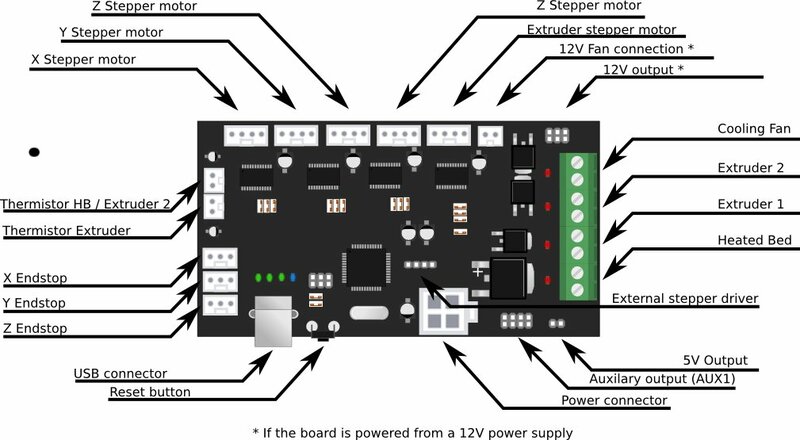 The table provided in the RepRap wiki is also quite good for that purpose (http://reprap.org/wiki/Comparison_of_Electronics) and includes more variables and designs. Nevertheless, in this article we will show our own as a summary of them both, as none of them include a very important variable: price. Following is a listing of the wirings of each of the designs enumerated in the table. In them it is possible to identify each one of the features highlighted in our table. RUMBA: A very good design, only a bit too sensitive to electrical noise. The SD card reader expansion is a must in this board. Azteeg X3: Alike the Megatronics, this board also combines RAMPS and Arduino Mega in one board. However, is a bit limited since it is not prepared for LCD. 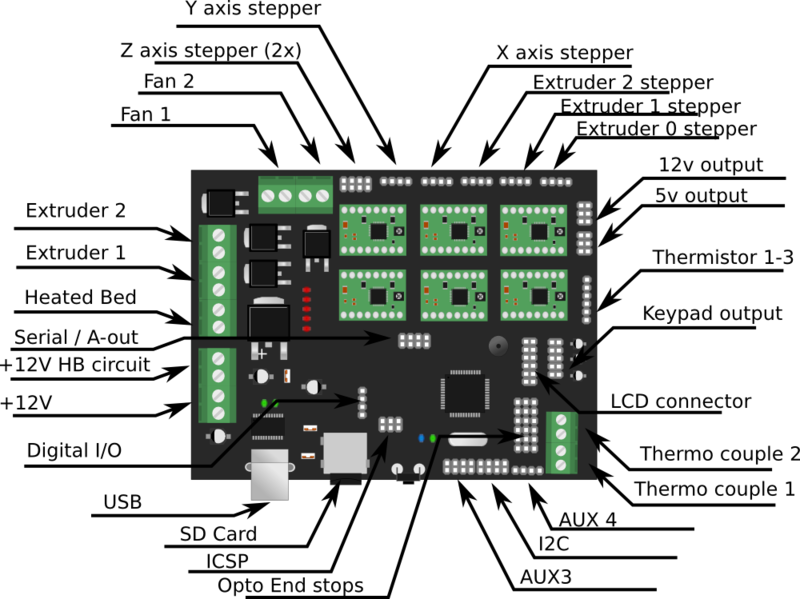 Minitronics: The minitronics is a very compact and minimalistic board, although very complete for 3D printing. It has the economic advantage of having the drivers integrated. 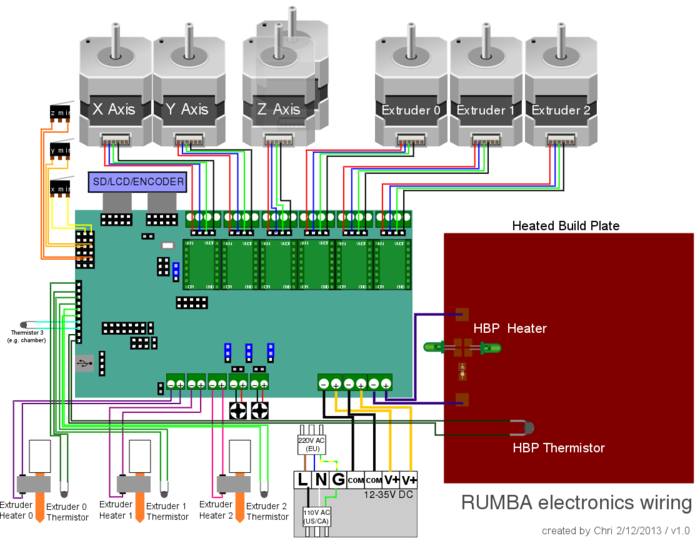 Smoothieboard: The Smoothieboard is a very recent project for a universal CNC controller. Has a powerful processor and many capabililties outside of 3D printing. 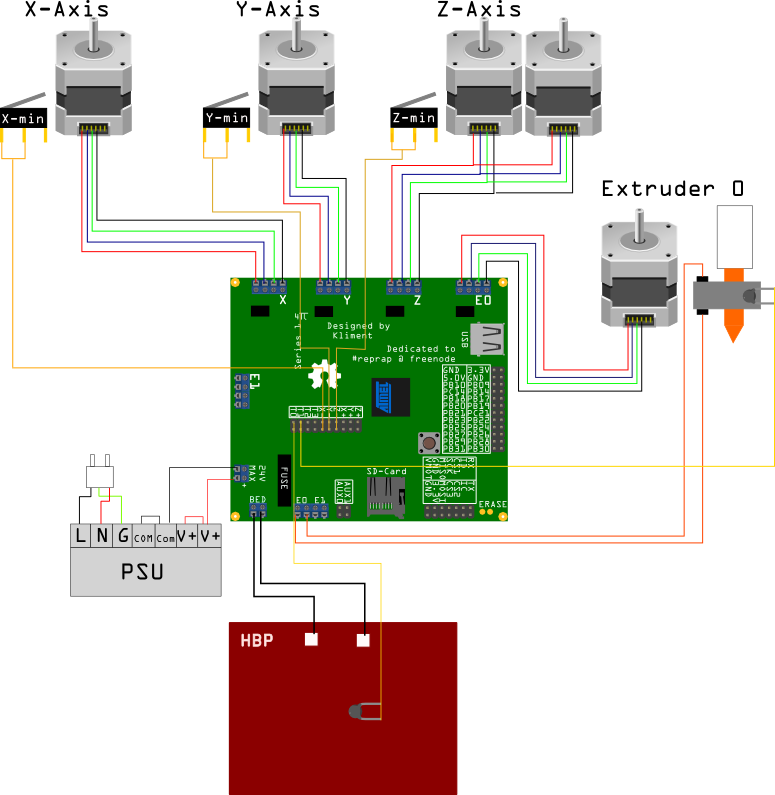 RAMPS1.4: The RAMPS is the original and widely used RepRap board. After two years is already in version 1.4. It has probably the widest community support of them all. Sanguinololu: This is a low cost solution, only limited by its absence of LCD, lower memory capacity and possibility of just one extruder. 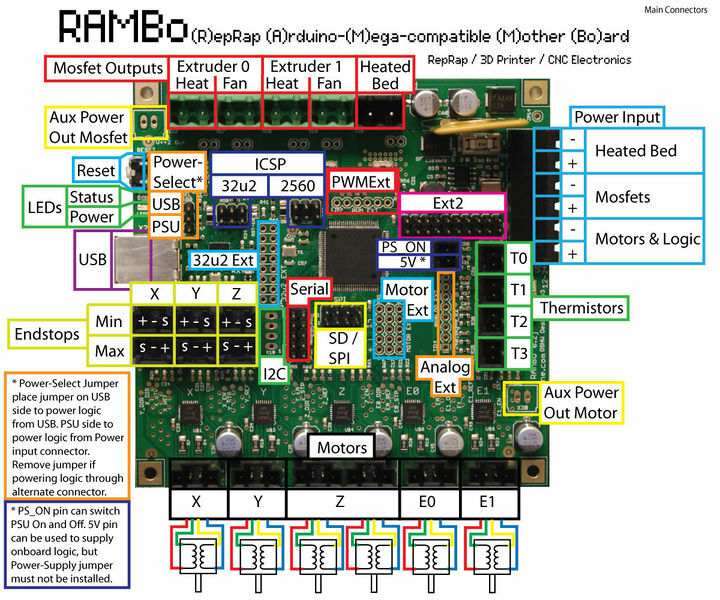 RAMBO: A very complete board, with integrated stepper drivers and possibility of two extruders. Very interesting low resistance MOSFET output for lowering the temperature and reliefing the need of ventilators. License: It is the type of copyright permissions. As we are dealing with opensource designs, most of them are GPL or Creative Commons, which is very good and greatly reduces costs. Dimensions: This is the size of the board. It is important, as too compact designs make it difficult for the DIYer to solder and build his/her own circuit, but too big ones increase some costs (fabrication, delivery) and might take too much space from our final machine. Processor and memory: As Arduino can be considered the battle horse of the opensource hardware electronics, most boards incorporate its Atmega Chip as main pocessor, normally at 16Mhz of speed and 128Mb or 256Mb of RAM. Mosfet outputs: This feature is related to the high amperage outputs, i.e. extruders and hotbeds. MOSFET stands for Metal Oxide Semiconductor Field Effect Transistor, and as any transistor they are current amplifying devices. High currents are needed to create the electric heat used to melt the plastic. 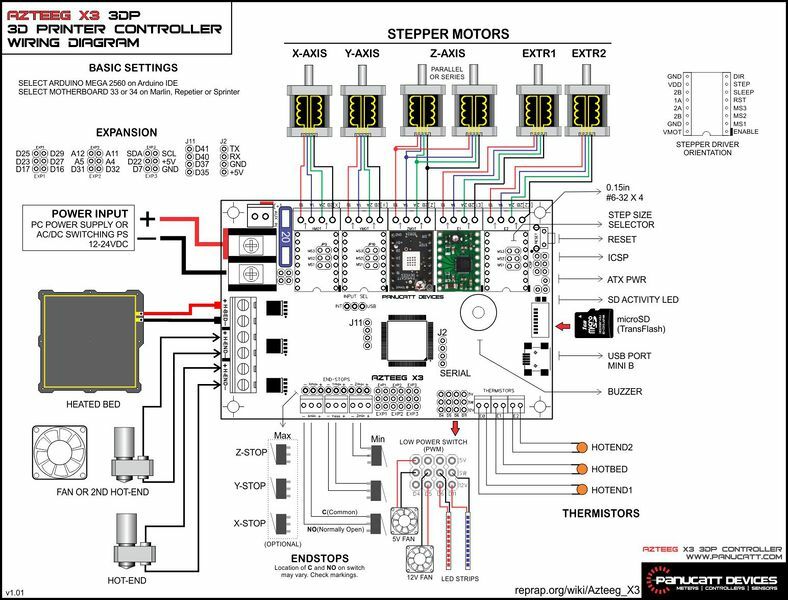 Stepper drivers: The stepper driver takes the signals from your microprocessor and translates them into stepping signals to actually drive your stepper motor. Although there are several designs and options, most of them are based on the Allegro Industries (http://www.allegromicro.com) series of bipolar stepper motors. Maximum number of extruders: A common upgrade is to increase the number of filament extruders from one to two. The reason is not just that it allows for printing in two colors but, more interestingly, with multiple materials. When complex shapes are needed one of the materials (water soluble preferably) is used as support and then removed once the print is done. End stops: End stops are safety switches to warn the processor that the end of the printing space is reached. The number of end stops needed is generally no more than 3, one per dimension, but most boards present up to 6. Thermistor inputs: Thermistors are resistors that change of resistance with a change in temperature. They are used to sense that the heatbed and the extruder are at the necessary temperature to melt the plastic. Thermocouple: A thermistor is usually more accurate as a sensor than a thermocouple, but thermocouples can handle higher temperatures and are linear. A thermocouple gives a really small voltage that can be calibrated and conditioned into a form readable by the electronics. Thermocouples can be more sensitive to noise because of this low voltage. and refers to the application that one needs to install in the computer to program and communicate with the processor. As most processors are Arduino based, the platform is always the default Arduino IDE. 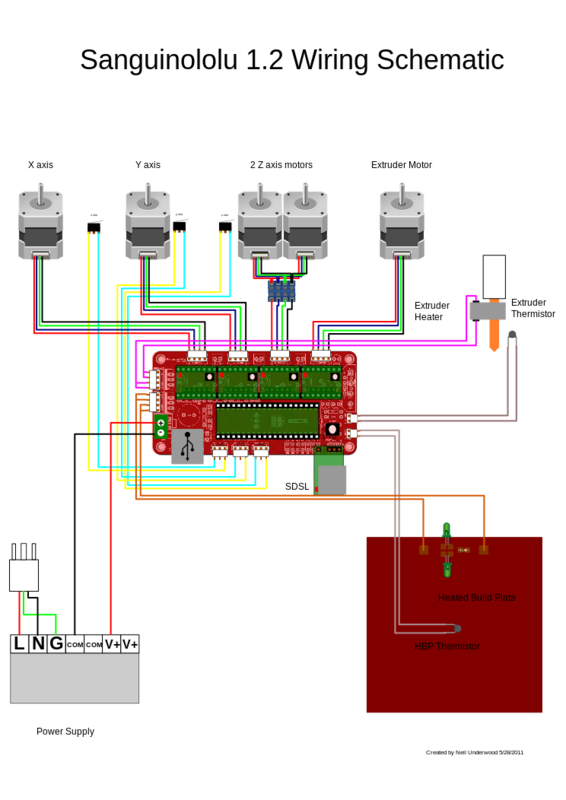 LCD: In order to have a really autonomous printer one needs some form of interface to read the status of the printer. The possibility of an LCD device is very important in this sense. Autonomy is important because printing times tend to be quite long (normally hours), and failures in computer-printer communications are not rare. Keypad: As important as it is to be able to know what is going on in your RepRap printer, it is to be able to send commands to it. When a computer is not available for such purpose, a keypad renders very useful. SD card: The last step in having an autonomous printer is to give it some memory capacity. The average size of a .stl file is not particularly large, say less than 1MB. However, the real format your RepRap will be dealing with is G-Code, which generally expands a bit. A 30×45 cm complex shape, in G-Code, might be 400MB in size. This is far beyond the capacity of your AtMega. Price: As usual, knowing how much one has to pay to have one of these devices is a determinant factor. We have been shopping around in order to get this data.